Watch video of Dan showing the Cedar we use. Should I seal my Western Red Cedar Furniture? If so, what do you recommend? These are the most asked questions that we receive. All the furniture we currently sell online are shipped to you unfinished. They are sanded smooth and all the edges are rounded over. So, now I ask you do you like the colors of the cedar as it is now? If so, we would recommend you seal it immediately with an outdoor sealer that has UV inhibitors in it (some color) to prevent the sun from fading it. If properly sealed your furniture will last 35+ years. -Rymar Xtreme Weather Wood Sealer, #7625 Natural Cedar Honey Oil Based available at most Sherwin Williams Stores. I like the natural patina grey look, how do I get it to look like that? Just leave your furniture alone and it will weather to a beautiful patina grey in just a few months. While rustic in appearance, you may reduce the life span of your furniture left unfinished, but should still get 20+ years. If you prefer the patina look, our suggestion is to let it weather to the color you like then apply a clear water seal to the surface. Although western red cedar is a naturally durable, leaving it untreated is not recommended for outdoor furniture just from the surface smoothness standpoint. Remember, applying a finish or protective coating will greatly increase its service life. Western Red Cedar grows in coastal forests from British Columbia Canada, to California, along rugged mountains. It is a wood of exceptional beauty with warm mellow tones ranging from light amber to deep honey brown. It also has an aromatic fragrance unlike any other species. Western Red Cedar contains natural oils that act as preservatives to help the wood resist insect attack and decay. It is not uncommon for Western Red Cedar furniture to last 30-40 years with minimal maintenance. Because of regional differences in soil and climate conditions, Western Red Cedar can have varying characteristics. This is important to know when choosing products made from Western Red Cedar. The large old-growth trees found in British Columbia yield clear heart-wood, which is used to make clear bevel siding - the most prized, (and the most costly), Cedar product. But, these trees also have a high amount of shake, rot, splits and large knots. Young-growth Cedar, found mostly in Washington State, has less clear heart-wood, but contains more material suitable for tight knot sidings. It has a lighter, more uniform color than old-growth Cedar and its knots are small and inter-grown with the surrounding wood. Young-growth cedar has the added advantage of being renewable. Western Red Cedar is one of North America's great renewable resources. Slow growing and naturally durable, Western Red Cedar has one of the longest lifespans of any North American softwood. It produces long lengths of timber with true, straight grain. -It is free from pitch and its heartwood has natural decay resistance. -Its low density gives it an insulation value superior to most other species. -Light weight, easy to work, easy to finish, possessing outstanding dimensional stability, Western Red Cedar is a preferred wood for nearly all purposes where attractive appearance or resistance to weather is important. One of the lightest commercial softwoods, the density of Western Red Cedar at 12% moisture content is approximately 23 pounds per cubic foot with a relative density (specific gravity) of 0.34. The density of oven-dry material is 21 pounds per cubic foot. Western Red Cedar has good fastening properties. Nails and screws used to fasten Western Red Cedar should be about one-third longer than those used to fasten hardwood species. Because it is free of pitch and resin, Western Red Cedar has excellent gluing properties, comparable to those, for example, of old growth Redwood and American Chestnut. It works well with a wide range of adhesives. Dan’s Manufacturing has been in business for over 33 years now, and ships to 47 states. 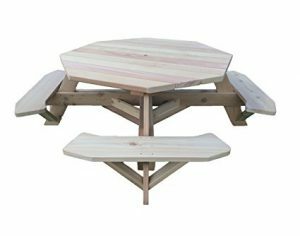 According to their website, this is their best selling wood picnic table. It’s hand-made in their warehouse, and like all their products, is stunning!